EnviroInsite's application-level properties are retained between executions of the program, irrespective of whether or not a particular document is saved. The application-level properties may be accessed and changed by selecting File> Application Settings from the program menu bar. The Search for files in document folder option facilitates finding necessary project files. EnviroInsite document files contain the full path the of the ancillary files used in EnviroInsite. This includes data files, CAD files, image files, layout templates, etc. When loading a document file with the Search for files in document folder option checked, EnviroInsite will first search at the specified path contained in that file. If the ancillary file is not at that path, EnviroInsite will look for the file using the filename and extension in the folder containing the EnviroInsite document being opened and all subfolders. This option is useful when transferring EnviroInsite documents between computers. 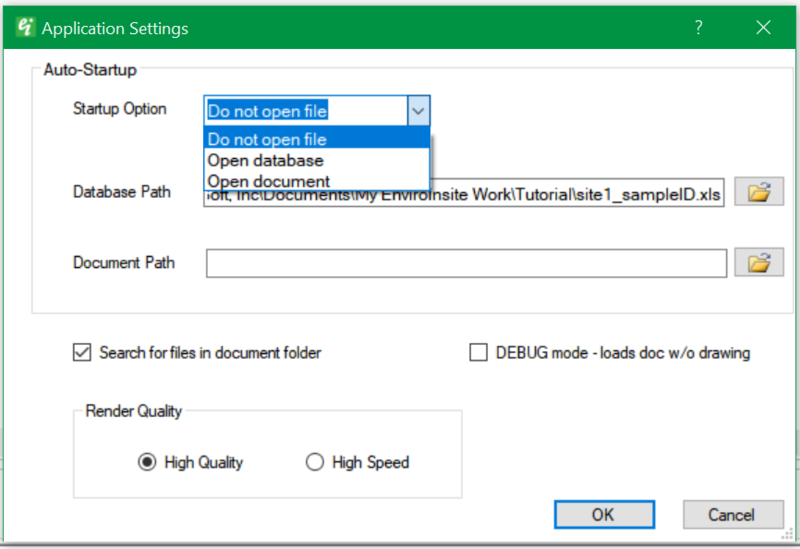 If this option is not checked, EnviroInsite will only look for files at the exact path specified in the document file and then prompt the user to search for the ancillary files.